Above: "The Cube": Redox's 25kW PowerSERG system contains 32 solid oxide fuel cell stacks, which can be individually replaced. Although Redox is currently designing stationary generators, the technology could also be adapted for use in vehicles. Below: Materials Science & Engineering and Chemical & Biomolecular Engineering professor Eric Washsman opening The Cube to check its fuel cell stacks. Redox Power Systems, LLC, the startup company founded by Clark School professor and University of Maryland Energy Research Center director Eric Wachsman (MSE/ChBE), wants to swap generators and power plants for sleek grey boxes filled with stacks of fuel-flexible, solid-oxide fuel cells that produce electricity at an estimated cost of only $1 per watt. The technology, first profiled by the Clark School in 2011 and previously covered by the Washington Post, Forbes, Scientific American, MSNBC, and Science, was recently featured on MIT Technology Review's web site, and will appear in its November/December issue. 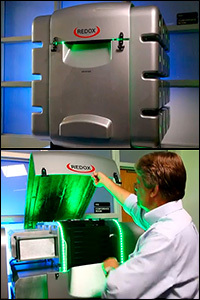 The article, "Avoiding the Power Grid," describes Redox's prototype PowerSERG system (nicknamed "The Cube"), which the company hopes to produce commercially starting in 2014. The device is about 4' cubed–the size of a large washer or dryer–but capable of generating 25 kilowatts of electricity, enough to power a strip mall. Units designed for homes would be even smaller. Redox envisions the PowerSERG replacing diesel generators in rural areas and developing nations, as well as reducing stress on existing power grids. See our original press release, "Want Fuel Cells? Think Outside the Hydrogen Tank."